The Dark Cahill wet fly with hidden bead is an excellent searching pattern on the McKenzie and Willamette rivers in the spring time. 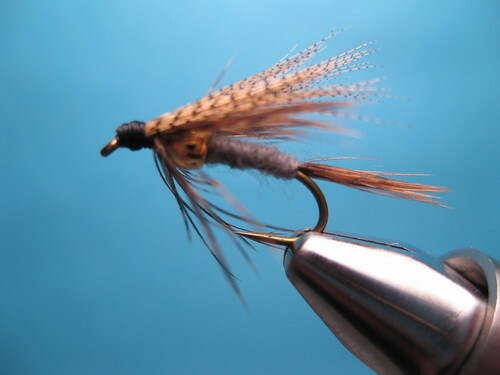 The body of this fly is made of Uni-yarn, an interesting alternative for folks who have a hard time making nice tapered bodies with traditional dubbing. This entry was posted in Fly Tying, Proven Spring Fly Patterns. Bookmark the permalink. Thanks for a great video! Is this also a good searching pattern on other rivers? Like the North Umpqua for trout? You should wear the same color shirt for each video. Just for the sake of visibility. Not the gray one in this video. I am old and my vision is fading. Great video. I’d like to try some of these flies this spring! It will be here before we know it. Forgive my ignorance but what does “searching pattern” mean? Searching patterns are usually used when there is no really exact hatch to match. They tend to be flies that imitate several types of bugs at once. A Parachute Adams is a great example of a searching pattern. It is not really any one bug—it just looks buggy and hopefully yummy to the fish. Great job, this is one of the few “bead” pattern flies I’m interested in tying and fishing!